In this chapter, we look at the Small Basic TextWindow object. It is used to work with text input and output. The TextWindow is an object where we can receive text input and write text output. 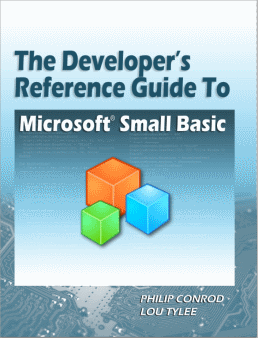 In Small Basic, text windows are usually used for simple programs with no graphic elements. We used the text window in the examples in Chapter 3. Gets or sets the background color of the text to be output in the text window. Gets or sets the cursor's column position in the text window. Gets or sets the cursor's row position in the text window. Gets or sets the foreground color of the text to be output in the text window. Gets or sets the left position of text window on your computer screen. Gets or sets the title for the text window. Gets or sets the top position of text window on your computer screen. Waits for user input before returning. Waits for user input only when the text window is open. Waits for user input before returning (but there is no ‘Press Any Key’ message). Reads a line of text from the text window. This method will not return until the user presses Enter. Returns entered text. Reads a key press from the text window. Returns the pressed key. Reads a number from the text window. This method will not return until the user presses Enter. Returns entered number. Writes text or number (data) to the text window. Unlike WriteLine, this will not append a new line character, which means, anything written to the text window after this call will be on the same line. Writes text or number (data) to the text window. 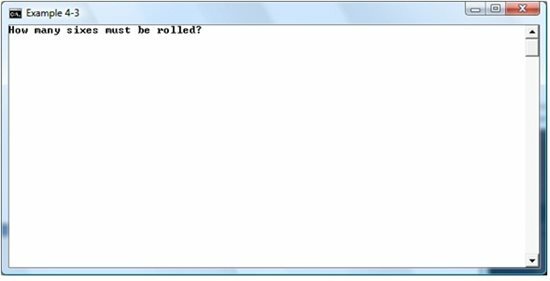 A new line character will be appended to the output, so that the next time something is written to the text window, it will go in a new line. To change the background color for the entire window, set the TextWindow.BackgroundColor property followed by a Clear method. The ForegroundColor property sets the text color. 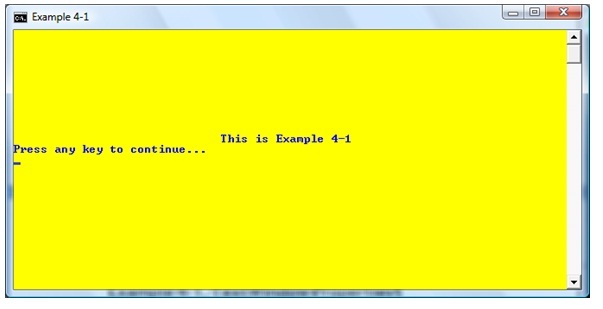 Write a program that writes blue text on a yellow background. Write a line of text near the middle of the window. Saved as Example 4-1 in Guide to Small Basic\Programs\Chapter 4 folder. This program illustrates use of all the properties of the TextWindow object. The Title property is set as are BackgroundColor and ForegroundColor. We use the WriteLine method (preceded by CursorLeft and CursorTop) to position the text in the window. Left and Top position the window on your screen. 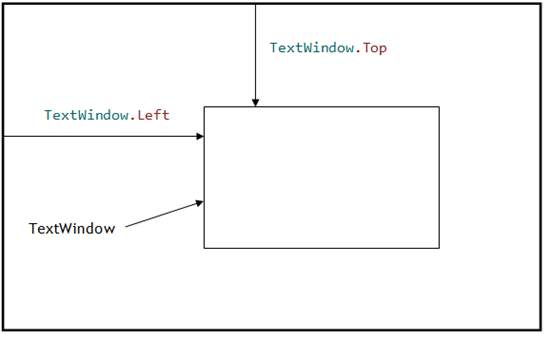 There are three methods used to get user input in the text window. The Read method is used to obtain text information. The <Enter> key is pressed to complete the input. Similarly, the ReadNumber method is used to obtain numeric information. With ReadNumber, non-numeric keystrokes are ignored. Lastly, the ReadKey method obtains individual keystrokes with no need to press <Enter>. 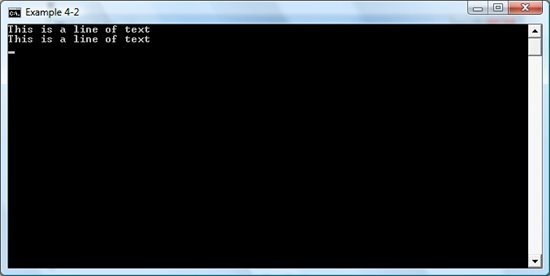 Write a program where the user first inputs a line of text then a numeric value. Lastly, intercept keystrokes typed by the user. Saved as Example 4-2 in Guide to Small Basic\Programs\Chapter 4 folder. To stop the program, click the X in the upper right corner of the window. An alternate to WriteLine is the Write method. It writes information to the window, but does not append a new line character. Subsequent output methods start at the end of the information written by the Write method. The Write method is useful for providing prompts prior to a Read, ReadNumber or ReadKey method. Output using both WriteLine and Write can be positioned anywhere in the text window by setting the CursorLeft and CursorTop properties prior to using the output method. By default, each output method uses a CursorLeft value of 0. CursorTop is incremented by one with each WriteLine method. 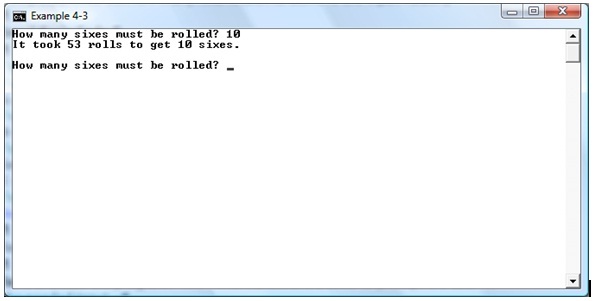 Write a program that rolls a dice until an input number of sixes is rolled (we showed this code when discussing While loops in Chapter 2). Once the rolls are complete, write out how many rolls it took to achieve the input value. 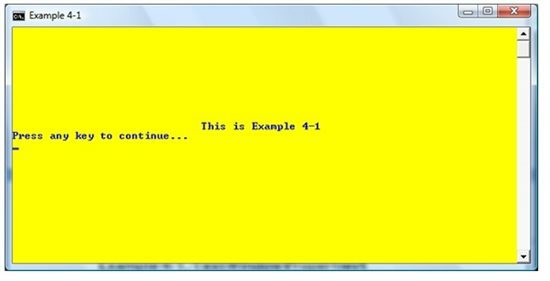 Saved as Example 4-3 in Guide to Small Basic\Programs\Chapter 4 folder. Theoretically, it should take 60 rolls (since each roll has a 1 in 6 chance of rolling a six). At this point, I can type in another value. Try several values. Stop the program when you are done. Use of the TextWindow object. Difference between Read, ReadNumber and ReadKey methods. Difference between WriteLine and Write methods. The TextWindow object can only accept and output text information. Next, we look at the GraphicsWindow object which allows graphical elements.